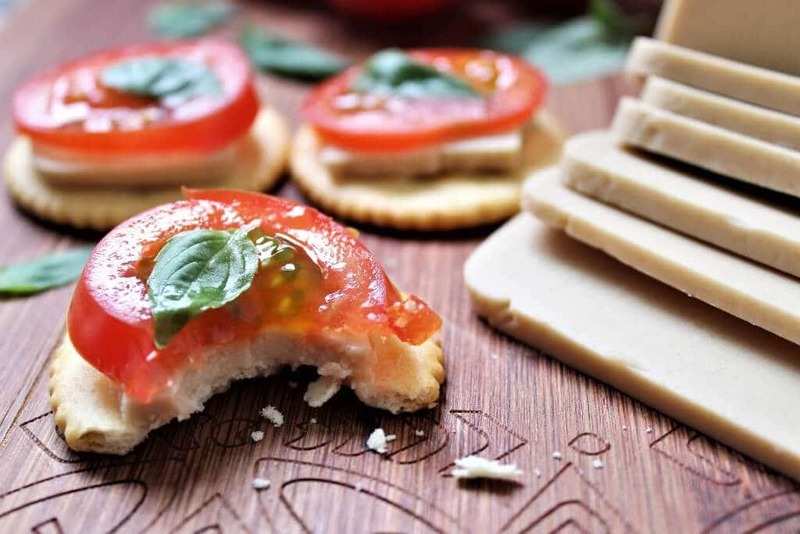 This vegan mozzarella recipe will soon be your favorite vegan cheese! This cheese is made from coconut milk and is free of gluten, soy, and nuts, so everyone can enjoy it. It may seem like a lot of work to make your own cheese, but I promise that it’s easy and well worth it! What do I need to make this vegan mozzarella recipe? 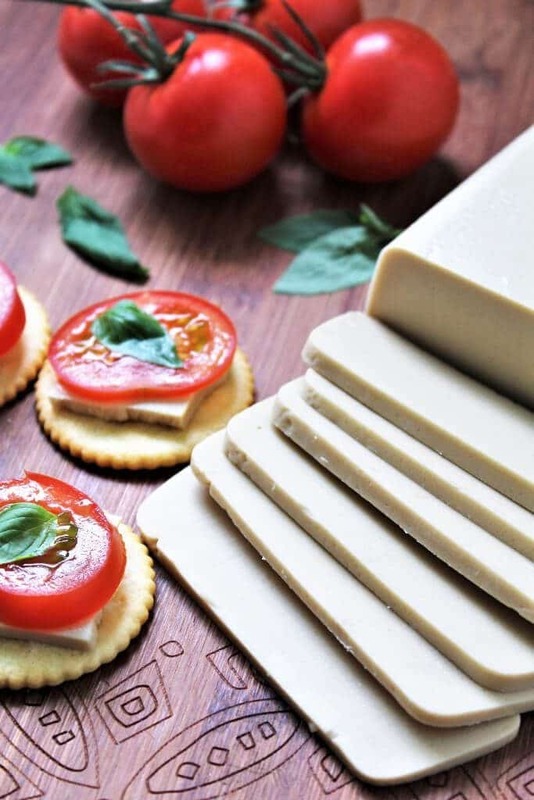 With just a few ingredients, you can make the most delicious vegan cheese you have ever had! Full fat coconut milk gives this dairy-free cheese a rich creamy texture. Salt and nutritional yeast give it the cheesy flavor. Agar-agar is a white powder made from seaweed, and it acts like a vegan gelatin making the cheese firm. (It comes in flakes or powder but uses the powder. It is less expensive, you need less of it, and it blends easier and smoother. You can find great prices on it at most Asian markets or you can buy it on Amazon as well). Finally, a little tapioca flour gives the cheese a little stretch when it melts. Put all together, and it makes the perfect vegan cheese. You can make this vegan mozzarella recipe in 2 ways. You can make it firm and sliceable; perfect for serving on crackers or simply snacking. You can also make a softer mozzarella that will melt when heated to use on pizza or melted in a grilled cheese sandwich. See the recipe for both variations. Simply pour all the ingredients into a saucepan and stir with a whisk. Heat it to a slow boil and continue to simmer it for 6 minutes until the agar agar is completely melted and smooth. Pour the cheese into an oiled glass container. Then, let it sit uncovered for about 15 minutes until it cools slightly, then put the cheese into the refrigerator to cool for at least 2 hours. It will set up firm and be able to be sliced or shredded. 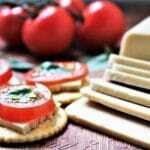 If you are making the melting style vegan cheese, it will set up softer than the variety with less tapioca starch. Check out my recipe for vegan smoked gouda! Can’t get enough garlic and herbs? Check out my vegan cheese with garlic and herbs! Looking for a classic vegan provolone recipe? 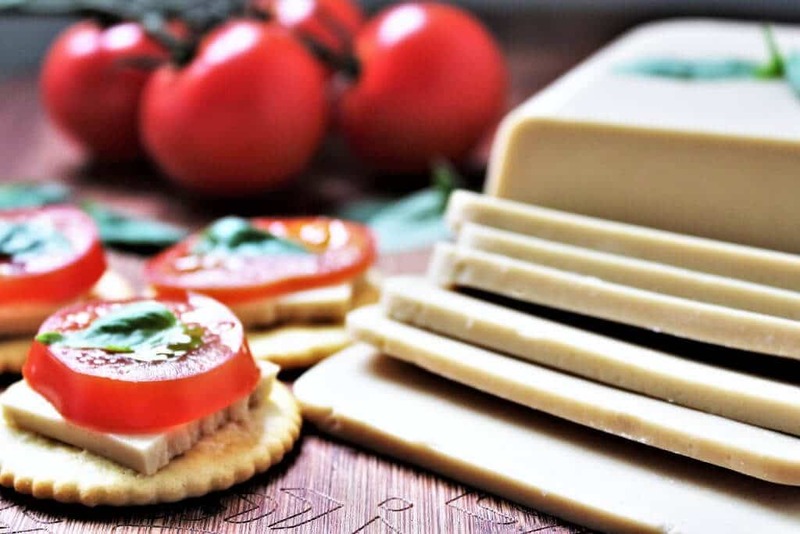 Learn how to make vegan cheese – provolone style. Did you make this cheese? Leave a comment and a rating so we can hear how it went. Prepare cheese molds by spraying a glass bowl or container with spray oil or rub any neutral flavored oil on the molds to prevent sticking. (Recipe will make about 2 cups of cheese). Pour the can of coconut milk into a saucepan. Put 1/2 cup of hot water into the empty coconut milk can to melt all the remaining coconut milk and add the water to the pan. Add all remaining ingredients to the saucepan and stir with a whisk. Turn heat on to medium and stir frequently until it boils. 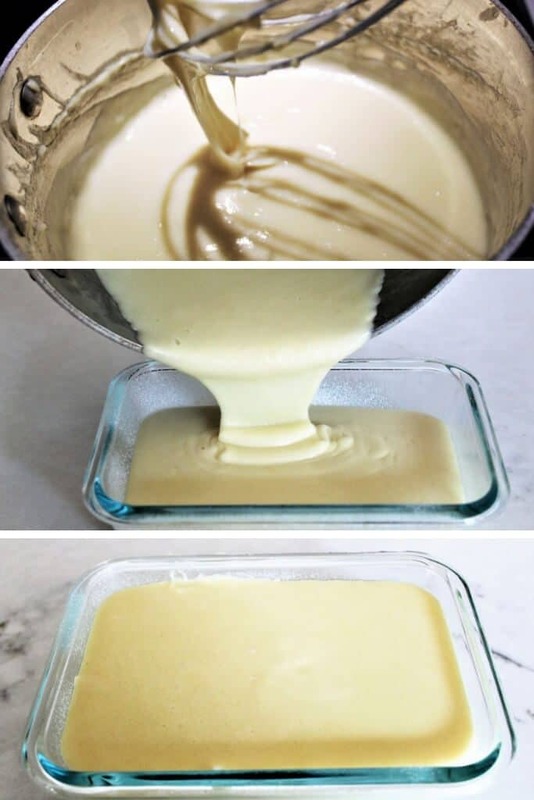 Turn down the heat until the cheese sauce is just barely boiling and stir constantly for 6 minutes until it is very smooth. Immediately pour into the prepared cheese molds. Let it cool with the lid off for about 15 minutes at room temperature, then transfer to the refrigerator for at least 2 hours to firmly set. Once the cheese is cooled completely, cover and store in the refrigerator in a sealed for up to a week. To make this cheese able to melt and better for use on pizza or grilled cheese, add 2 additional tablespoons of tapioca starch. For best results when melting, let the cheese heat up to room temperature before cooking. This cheese melts beautifully in the microwave too! For a firmer cheese, leave out the tapioca starch from the recipe. Love this recipe! I’ve added chilli flakes and chilli sauce to make a spicy mozzarella! Perfect for a grilled cheese, just toss a couple avocado slices in there and you’ve got yourself a nice easy lunch. Thank you for the recipe, this saves my bank account from the high price of other vegan cheeses. Is the whole can of coconut milk to be used…solid and liquid? Yes, use the whole can both the solid and liquid. Hope that you enjoy it! I do not use gelatin myself, but I have heard from one reader that it didn’t work well. If you try it, let me know because I get that question a lot. I have read that agar agar and gelatin will swap 1:1. Hey – so, I want to be sure to understand – is tapioca flour different from tapioca starch?? If I want melty cheese, do I need to use both? Or is it the same thing? I’m a little confused, but I’m excited to try this recipe for a vegan lasagna! 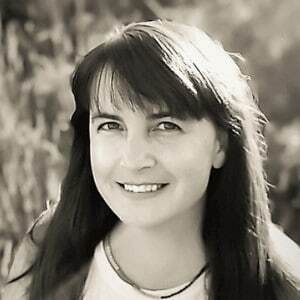 Hello Monica, thanks a lot for your quick response ! I have found some tapioca starch so I’ll enjoy this “cheese” tomorrow, thanks, take care. First time making this and honestly I LOVE it!! So genius! I can’t wait to brag about making my own vegan cheese 😅 this is so worth your time and effort (which barely takes any) thank you so much for the recipe! Can I substitute agar powder with guar gum? If so in what proportion? Hi Vidhi, I do not think that guar gum will work, although I have never tried it. Agar powder or flakes is really the only thing that will give you the right cheese texture. Your description mentions lemon juice but the recipe doesn’t list it. How much lemon juice should go in? If we add the extra 2 tablespoons of starch will it still be firm enough to cut/slice? If we don’t add the extra starch will it still melt? This cheese is delicious! My kids and husband will even eat it! Thanks for the recipe!